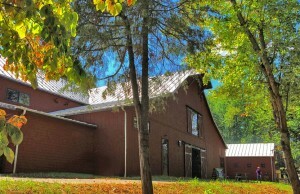 Our cidery in the heart of the Blue Ridge Mountains is open daily for tours, tastings and hard cider to go. You are welcome to picnic with our ciders on the deck or down by the river. Our tastings are for anyone 21 or over. We have sparkling sweet cider for others. Tastings feature 6 ciders on draft: 2 draft ciders are free of charge, with a small additional charge for a tasting flight of the other 4 draft ciders. At our service bar you can get Bold Rock by the glass or longneck bottle and order food from our menu of light appetizers. You are also welcome to bring a picnic to enjoy inside or out on our decks and terraces. From cider history to modern production, you’ll see how tradition and technology come together in Bold Rock’s working cidery. See where we crush apples, ferment and bottle our hard ciders. We enjoy showing folks around our cidery and love talking about cider. There’s a good chance you’ll run into one of our friendly founders, John or Brian, so feel free to say hello. You’re also welcome to take a self-guided tour of our production facility and watch the bottling process or visit our Cider Museum for a tour of cider facts and artifacts. Our main room is a beautiful open space with a handmade brick fireplace, 34′ high vaulted ceiling, and oak timber beams. It connects to our tasting room, which also has a handmade brick fireplace, a massive timber beam, and a floor-to-ceiling glass wall looking into the cidery’s vats and bottling line. Step outdoors onto our decks and enjoy spectacular views of the Rockfish Valley and Blue Ridge Mountains. This private side room with windows facing the river is perfect for smaller gatherings during our business hours Mondays through Thursdays.